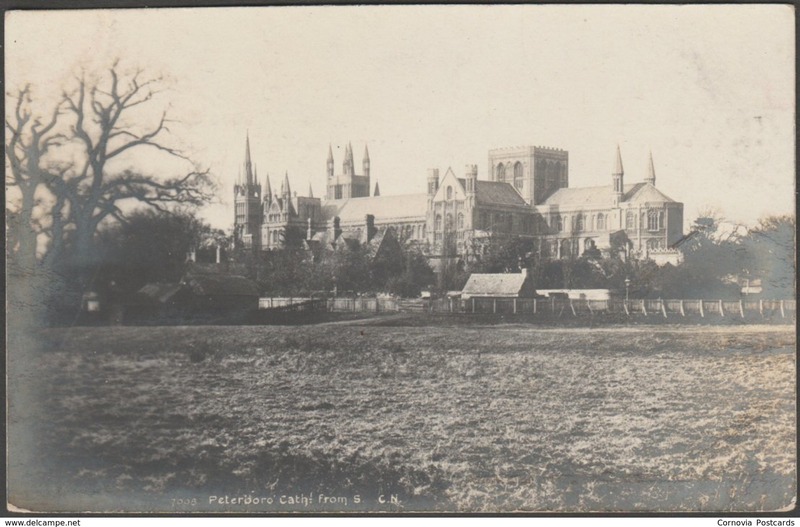 Monochrome real photographic postcard showing a view of the Cathedral at Peterborough in Northamptonshire. Published by The Photochrom Co Ltd, London, No 7008, c.1910s. Postally unused, but with message. Good condition, with slight corner bumps and some silvering to the edges. PLEASE WAIT FOR INVOICE TO BE SENT BEFORE PAYING. THANKS! Postage is combined and is charged for the first item only. No extra postal charges for additional items purchased in the same transaction. Purchases totalling £20.00 GBP or above (before discounts are applied) will always be sent at no charge by Recorded Delivery to ensure that they arrive safely. If your items total less than £20.00 GBP please let me know if you require anything other than standard postage before paying. I am always happy to wait for up to 4 weeks for payment (for those who are paid their wages monthly etc) but will send a reminder every 2 weeks. I am always open to offers, especially for more expensive items or for multiple purchases. 20% discount if you buy 10 or more cards in one purchase. 10% discount if you buy 5-9 cards. 5% discount for 3-4 cards. UK: Royal Mail 1st Class is £0.80 GBP. UK: Royal Mail Signed For is £2.00 GBP. EUROPE: Royal Mail International Standard (Small Packets) is £1.70 GBP. EUROPE: Royal Mail International Tracked & Signed (Small Packets) is £6.75 GBP. REST OF THE WORLD: Royal Mail International Standard (Small Packets) is £2.40 GBP. REST OF THE WORLD: Royal Mail International Tracked & Signed (Small Packets) is £7.40 GBP. UK: Royal Mail Signed For is FREE. EUROPE: Royal Mail International Tracked & Signed (Small Packets) is FREE. REST OF THE WORLD: Royal Mail International Tracked & Signed (Small Packets) is FREE. Payment by PayPal, Delcampe Pay or Bank Transfer. Please note that extra charges may be applied by your bank for Bank Transfers if you are not drawing on a UK bank. Please check with your bank for details. I will accept UK cheques as well as cash in either GBP or Euros, depending on the amount, at the sender's risk. Contact me if you wish to pay by either of these methods. I no longer accept payments using Skrill. All postcards will be posted within 2 working days of your payment clearing, though generally in less than 24 hours, and will be sent in a Polyprotec sleeve in a card-backed envelope. My scans are high quality and include both sides of the entire postcard, including the corners. My descriptions are as accurate as my ability allows. 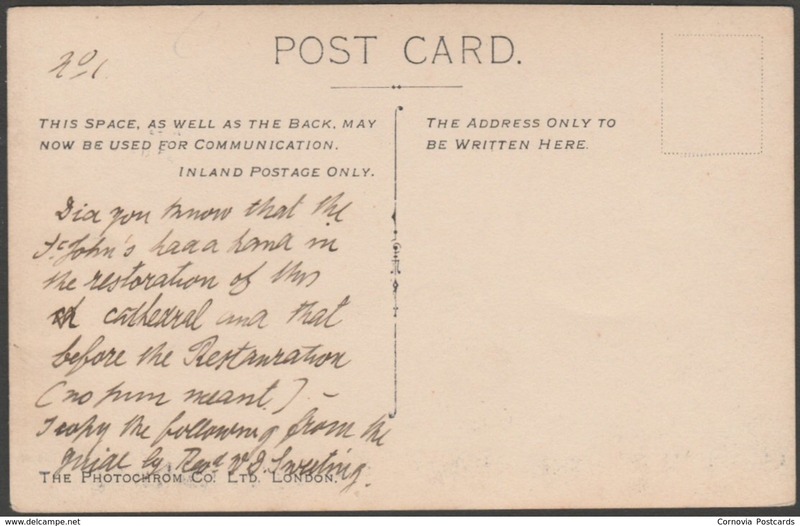 All of the postcards are genuine vintage cards, unless the description clearly states otherwise. I have been selling postcards for over 13 years and have always had 100% positive feedback on eBay (x1200), eBid and on delcampe. I sell postcards, antique, vintage and some modern, mainly topographical, though I also have plenty of transportation, advertising, entertainers, greetings and artist signed, as well as many others. I specialise in postcards of Cornwall. Find us on Facebook. Find us on Twitter. Find us on Pinterest. I buy books relating to Cornwall and to the prehistoric monuments of Western Europe. I also collect postcards of prehistoric monuments and have well over 1200 of these so far. eBay user since 12 Jan 2005. I have been selling postcards for over 12 years and have always had 100% positive feedback.